Have you been doing various searches or combing through the pages the full iPad app directory since those apps started going live earlier? 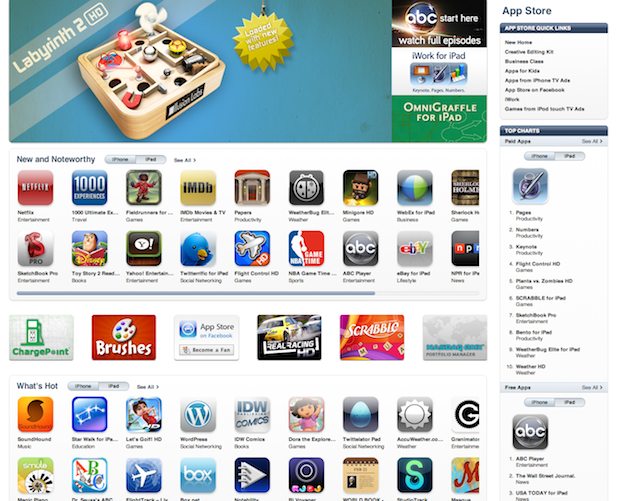 Well stop — because Apple has just completely revamped the App Store to be iPad-centric. 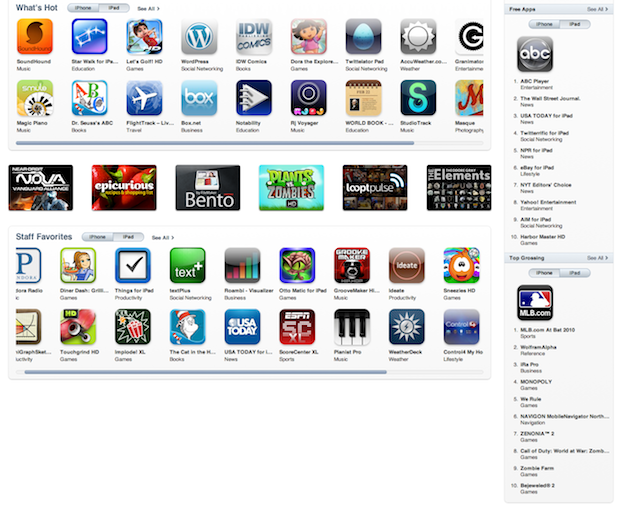 As you can see in the screenshot above, the front page of the App Store is now dominated by iPad apps. Yes, the iPad apps that 99.99% of the world cannot use yet because no one outside of a select few testers has the actual device. But that isn’t stopping Apple from promoting the hell out of these apps. And it’s working — at least for me. I’ve already bought a ton of them, and I don’t have an iPad yet. Humorously, Apple is promoting a bunch of apps that it has asked developers to create embargoes for, for the press. Earlier today, Apple moved that embargo time up from Saturday morning (the actual iPad launch) to tomorrow morning, undoubtedly because they knew they’d be rolling these App Store changes live. Still, Apple is already showing a ton of embargoed apps on its “New & Noteworthy,” “What’s Hot,” and “Staff Favorites” areas. As you can see, Apple has added a button to toggle between iPhone and iPad apps for each area (as well as the charts portion). Oh, and all of the featured areas on the main App Store page are currently iPad apps too except for the one App Store on Facebook promotion. This includes the main banner area which is shuffling through iPad apps such as Labyrinth 2, ABC’s streaming app, OmniGraffle, the WSJ app, and Apple’s own iWork apps. A few other iPad apps Apple is featuring include the Netflix app (yes, it’s real), Epicurious, and the Pandora app.